Ever since the earliest days of photography the production and publication of a book of their own work has been one of the dreams of most photographers, but one that would remain a fantasy for all but that tiny minority who could attract the attention of commercial publishers. But now, with the advent of digital printing technology, the cost of producing your own photobook can be less than the price of a packet of inkjet paper and, thanks to the internet, the costs and complications of disseminating the finished product have been dramatically reduced. Moreover, you can use your desktop computer to design, print, advertise and distribute you own photobook without ever leaving the comfort of home or office. Whether your aim is to promote your work, display it to other photographers, create a record of the results of a personal project or simply entertain family and friends, the digital photobook offers a practical, economical means of producing a unique, high quality product of which you can be proud. 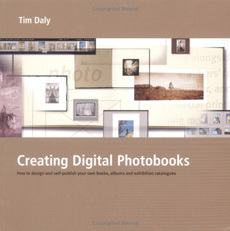 Tim Daly has been making hand-made books of his own photographs for over twenty-five years and is an enthusiastic evangelist for the new opportunities opened up by the combination of digital printing and on-line service providers. In this book he shows readers with no prior knowledge of graphic design, printing, publishing or even photography how, without using specialist design software, they can make a collection of their most prized images available in the most interactive, permanent and portable form possible - a book.